In 1981, Val Moffat was diagnosed with Multiple Sclerosis. By 1983 she was completely housebound. 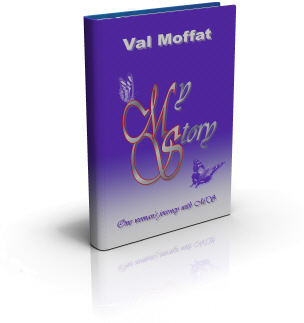 Above: Val Moffat, today, talks about her story and e-book. WMV format, please allow time to load or click here to download. Valerie Moffat was diagnosed as having multiple sclerosis in May 1981. Her world was turned upside down: she faced the possibility of becoming a permanently, severely disabled person as the disease progressed. 85,000 people suffer from Multiple Sclerosis in the UK alone: Scotland, where Val lives, has the highest incidence of MS sufferers in the world. Val assumed that the double vision, stumbling and continual tiredness she had felt since her childhood were normal parts of everyday life - things common to everyone. It was only after her daughter's seventh birthday party, when difficulty with breathing along with pins and needles became almost unbearable that she was checked into a hospital and diagnosed with MS.
She found it increasingly difficult to cope with the tiredness and unsteadiness of MS after her diagnosis as time passed and the condition worsened until one day in 1983. 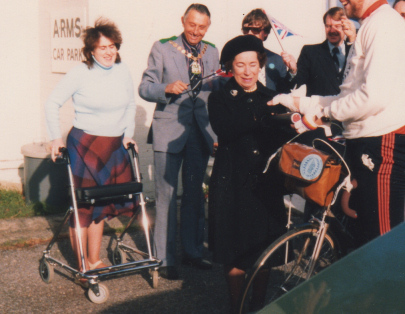 After a fall at home in 1983, Val became completely housebound as MS had a chance to take hold in the wake of her fall. She had to spend 15 months confined to a wheelchair, almost completely disabled with the disease. After this time, she had to rely on a Rollator to move. Pictured: Val Moffat, on the left, with Rollator to aid movement. Performing every day activities became a feat: a plight familiar to Multiple Sclerosis sufferers all over the world. Life became a struggle for her and the condition put a strain on her relationships with those around her. After spending two years struggling with the disease, she was ready to try anything to help in her battle with the condition. Val got an independent practitioner to perform some tests on her: the results of which she used to make informed changes to her lifestyle. Combining these changes with special mental and physical exercises, the symptoms of Multiple Sclerosis began to subside and become tolerable. As more time passed she began to make a more marked improvement... Finally, she walked from her bedroom to the bathroom unaided. without the need for any medication! At present, there is no cure for Multiple Sclerosis. Valerie's unique discovery did not cure her MS, and her book does not contain a cure for the disease. Instead, it contains a plan to be followed that helps the body keep the symptoms of the disease under control. Val Moffat had discovered a highly simply way of controlling the disease's symptoms without expensive medication that often have unwanted side effects. Other people Val knew who had Multiple Sclerosis saw the way she had been improving and were keen to find out what her secret was. Val learnt how to perform the same tests that had been performed on her and tailor a solution for each person she visited. Val and her husband travelled to London, Oxford, Yeovil and even Cumbria performing tests and teaching people their secret. After these tests, the people they had tested made the necessary changes to their lifestyles and many began seeing results similar to Val's! Eventually, Val and her husband had tested several hundred people. They correlated the information and noticed a constant trend in their findings. From this, Valerie wrote out a plan that could be followed by all people living with MS.
Valerie had created a unique system that could be followed by anyone with the determination to do so that could help control the symptoms of MS and keep the disease manageable! to battle the symptoms of MS with the world! This is "My Story: One Woman's Journey With MS"
Now, Val Moffat feels it's time to help the many people who live with MS all over the world. She has compiled an e-book of her struggle and triumphs that will inspire other people living with the condition and also teach them her little known plan that has helped her and hundreds of other people with MS.
"My Story: One Woman's Journey With MS" is the life story of Valerie Moffat, MS sufferer, walking due to an extraordinary discovery after months in a wheelchair . It is a compelling story in which she shares her secret and is available for $15.99 as a 180 page+ PDF. Filled with heart warming anecdotes, it provides a first hand insight into living with MS that will ring home with anyone familiar with the condition. The e-book also contains the simple, little-known changes that anyone can integrate into their lifestyle which relieved Val's symptoms and allow her to lead a normal life. 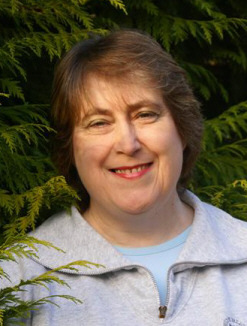 Val Moffat's book is ideal for people who care for those with MS. By helping to alleviate many of the symptoms of MS, people with Multiple Sclerosis can regain much of their independence, providing relief for carers. why doesn't Val give away her book for free? The answer is simple: she has. Valerie has shared her techniques with hundreds of people, and now, she wishes to help thousands. If you've asked this question, you're already skeptical about Valerie's book and her claims. Now imagine you were given the book for free, and followed her plan for 1 or 2 weeks and saw no improvement. You would most likely give up, and some of the people Val tried to help did give up after a short period time, and wrote off a chance at happiness in the process! There is a school of thought that if people pay for knowledge, they are more likely to value it. Valerie's plan requires dedication and around 3 weeks before improvements will show. This is not an instant fix; improvement is gradual and does require work. By asking people to pay for her book, she feels people will be more likely to take her plan to heart and dedicate themselves to following it long enough to see that it works. You can e-mail Valerie personally at ddrw_check@hotmail.com with any questions you have about the book, or her personal MS story. How bad do your Multiple Sclerosis complications have to get, before you're finally desperate enough, to actually do something about it? with MS and their carers. Order Now for just $15.99! delivered INSTANTLY for less than the price of a quality meal! Delivered instantly in PDF format, compatible with all computers. Order "My Story: One Woman's Journey with MS"
You will have INSTANT access to the downloadable guide immediately after purchase. Your credit card will show a charge by "CLKBANK*COM"
All major methods of payment are accepted. This information is not a substitute for professional medical advice. We are NOT doctors, nor are we pretending to be.